Sludge dewatering is a separation method of solid and liquid components for easily and more cost effectively handle the separate phases for final dry disposal. The liquid sludge has to be dewatered and removed water from the fluid state and converts it into a semi-solid or solid mud block. After dewatering, the moisture in sludge can be reduced to 50-80%, this mainly depends on the properties of sludge and sediment and the efficiency of dewatering equipments. Dewatered sludge is generally easier to store and transport than concentrated or liquid sludge. Why is sludge dewatering necessary? Sludge dewatering is the important part of sewage treatment system. After being concentrated and digested, the sludge still has a water content of about 95% to 97%, and the volume is still large. Additionally the sludge contains a large number of harmful toxic substances, such as parasite eggs, heavy metals, etc., useful substances such as phytonutrients, organic matter and water. For waste minimization and cost efficiency disposal, the sludge needs to be dewatered. The purpose of sludge dehydration is to remove the water between and within the sludge particles, so that sludge reduction, stability, harmless, and comprehensive utilization. 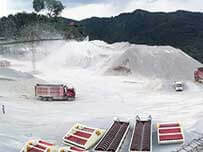 The ideal dehydration should be to remove the maximum amount of water, while the solids of sludge should be retained entirely on the dried mud cake, and the investment required for this operation is the lowest. 1. Reduce the sludge volume. Natural dry dewatering is to placed sludge on the drying field and realize dewatering through evaporation, infiltration and overnight overflow. However, the intensive maintenance management and easier produced a wide range of stench. Only suitable small sludge treatment plants. Mechanical dewatering is the use of mechanical equipment for sludge dewatering. Compared with natural drying, it has less land occupation and less stench. There are various technologies for mechanical sludge dewatering: vacuum filtration dewatering, pressure filtration dewatering, centrifugal dewatering, screw press dewatering. The equipment are including plate and frame and belt filter presses, centrifuging, and geomembranes. In addition to these, there are other options available. Chamber filter press(plate and frame filter press) is one of the mechanical pressure dewatering methods, that use filters to separate the liquid from sludge. There are manual, semi-automatic and automatic filter presses available. The chamber filter press is composed of filter plate and filter cloth that arranged to form a plurality of independent filter units. The slurry is driven by feed pump, enters each filter chamber, and is filtered by the pressure generated by feed pump. Due to the action of filter cloth, the solid is left in the filter chamber to form a filter cake, and the filtrate outlet valve is discharged. And the filter cake can be pressed to further reduce moisture content if necessary by introducing compressed air or high-pressure liquid. good sealing performance;basically applicable to all solid-liquid separation industries. Disadvantages intermittent operation; relatively low efficiency. Belt filter press is a widely used filter belt extrusion dewatering equipment. The dewatering process can be divided into four important stages: pretreatment, gravity dewatering, pre-pressure dewatering in the wedge zone and press dewatering. A certain concentration of flocculant needs to be mixed with the slurry to make the tiny solid particles in the sludge coagulate into a large floc-like mass and separate the free water. Disadvantages high water content of mud cake. Centrifugal sludge dewatering machine is composed of transfer and screw conveyor with hollow shaft. The sludge is sent to drum by hollow shaft and is inserted into the drum cavity under the centrifugal force generated by the high-speed rotation. Due to the different specific gravity, solid-liquid separation is formed. The sludge is conveyed to the cone end of drum by the auger and continuously discharged from the outlet; the liquid in the liquid ring layer is discharged by the continuous overflow of the mouth to the drum and discharged by gravity. not suitable for solid-liquid separation with close specific gravity. The screw of screw press dehydrator is installed in a cylinder composed of screen, and the diameter of screw body gradually becomes thicker from the inlet to outlet. As the volume between screw blades becomes smaller, the dewatering material is gradually compressed. The solid and liquid in the dewatering raw material are separated by compression, and the filtrate is discharged through the mesh of sieve, then flows to the filtrate collecting tank below the dehydrator and is discharged to the outside of the machine. less wearing parts; simple daily management. 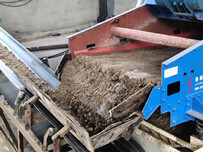 Disadvantages only suitable for handling high fiber sludge. The stacked sludge dehydrator is formed by fixed ring and swimming ring which are laminated to each other, and a screw shaft is formed therethrough. Full dehydration is achieved by gravity concentration and the internal pressure of sludge formed by the back pressure plate during the propulsion process. The filtrate is discharged from the filter slit formed by the fixed ring and the movable ring, and the mud cake is discharged from the end of the dewatering portion. 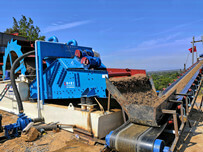 fully automatic; can direct dewatering for low concentration sludge. not good at dewatering sludge with large particles and high hardness. 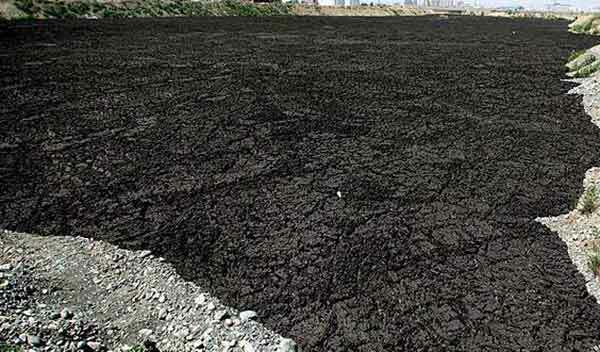 Geomembrane is suitable for light sludge dewatering( low ratio of solid to water in sludge). This technique is commonly used for basic types of residues from wastewater, sedimentation tanks and water filtration equipment. 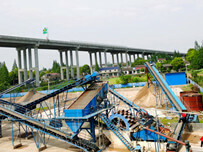 LZZG sludge thickening and dewatering method is divide into 2 stages: thickener and filter press. Thickening as the first step of sludge treatment is essential in order to separate the solid and liquid phases and reduce the volume of sludge by concentration. And the flocculants are sometimes used to achieve as high as possible dry matter in the machine dewatering and must be specifically selected for the sludge. Then, the dewatring process of filter press used to reduces the water content of the concentrated sludge. 1. About 20% water content of final mud cake can be directly dry disposal. 2.Reduces sludgevolume and saves storage and transport costs. 3. After purifying, more than 90% clean water can be reuse. 4. The two equipment can achieve continuous dewatering, eliminating the need for complex operational controls. 5. Fully automatic cleaning, fully automatic mud discharge and saving labor time. 6. Adopts suspension filtration, medium adsorption and sedimentation working, no purification membrane and no wearing parts. 7. The thickener is made of high quality carbon steel and has good strength and corrosion resistance. 8. Low cost of flocculants use, large processing capacity, high processing efficiency and stable performance. 9. Small size, small footprint and convenient installation. 10. The service life of the whole machine is 10-15 years, with less one-time investment and significant economic benefits. The use of LZZG sludge thickening and dewatering method is a economical and practical choice. We have design many sludge dewatering solutions for clients abroad. Previous：How to choose vibrating screen panels ?